August Snow was a delightful surprise in its early pages. It is a novel about a Detroit cop who loses his job because he whistle-blows corruption, then receives a 12-million dollar settlement, travels the world for a year, returns to his former home in Mexicantown In Detroit, and proceeds to privately investigate a murder. The delight was in Jones’ treatment of Detroit ... the interesting and often beautiful architecture, the varied and diverse food, the many generous residents, the disenfranchised poor and Black, the desperate and determined community struggle for revival. It was fascinating to read for a native-Detroiter, and I think it would be intriguing for non-Michiganders as well. While August Snow (the man) has some utterly delightful relationships (yes, Snow's persona reminded me of Robert Parker's Spenser), unfortunately I found the physicality too violent and gruesome for my tastes, so the last bits, where August is confronting, fighting, and killing the bad guys, turned this novel from 4 hearts to 3 for me. Now, here is an important question for all of you who were NOT born and raised in Detroit. Did you, in your growing up, go out for Maurice Salads, or is this a Detroit phenomenon? Snow waxes eloquently about this dish and I was salivating, remembering those day-long trips to JL Hudson department store in downtown Detroit, typically with my mom, where the high point of the day was the lunch break for Maurice Salad. Thanks for commenting, Gary! Come back and comment again if you read this and remember, please! I’m going to forward your review to my brothers. We all like to read Detroit-based books. And I have to comment on the Maurice salad bit. Growing up in Detroit and shopping often at Hudson’s as a kid, I NEVER heard of this! Fortunately, I was working in downtown Detroit in the last years of Hudson’s and co-workers introduced me. Why my mother never did this, I have no idea. Do you know if that was only at the downtown Hudson’s. When Northland Mall opened, my mom shopped there mostly. I always understood Maurice Salads were a Hudson’s only special. Will be interested to hear what other think. Jones, the author of August Snow, implies that Maurice Salad was only available at JL Hudson, downtown. Which raises another question .. where did we go to buy school uniforms? That was also downtown somewhere, I think! School uniforms?? Good grief, I don’t remember where we went for that! I do recall for Mercy High we had to go to a specific shoe store to buy specific loafers that had heals that wouldn’t scuff the floors. Do you remember that? 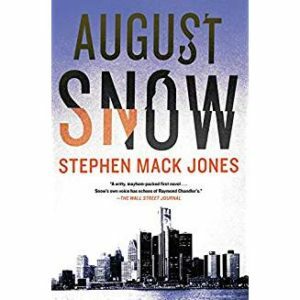 Just finished August Snow. Like you, I found the violence towards the end just too much. A real turn-off. The story line was OK but didn’t really interest or engage me. I did enjoy his Detroit references yet I felt he painted a pretty dark, depressing picture of the city. I do a drive-thru different parts of town every few years. Yes, there are some really sad, depressing areas that I wonder if they will ever recover. There are also some areas, and I am staying within city limits, that have never declined significantly and many areas that are recovering. If I didn’t know Detroit and read this book, I would never want to visit there. I hope in future Snow adventures, he visits other sections of Detroit and offers a more hopeful picture. Oh and one more thing that really bugged me about this author (and I find this often true for other new authors). Excessive focus on clothing. I feel a mark of a good author is when I get a sense of how a character looks and dresses without being told in detail what they were wearing, its color and fit, and what its price tag read. That’s interesting, Mary, about clothes commentary … I’ll watch for that!